The Air Pouch Model in rats or mice measures anti-inflammatory activity of test compounds and may provide insight into the mechanism of action. 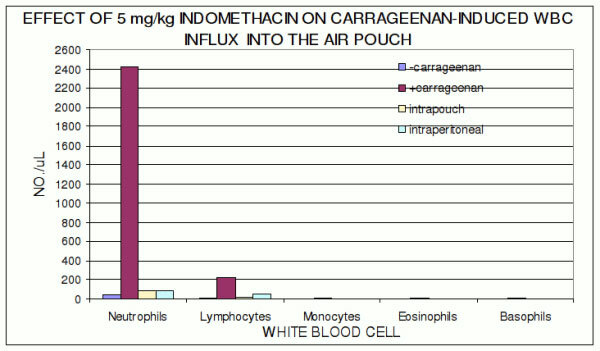 An Air Pouch is produced simply by subcutaneous injection of sterile air into the back of a mouse or rat. The formation of an air pouch provides a localized environment for study of inflammation and cellular response because the pouch has a lining morphologically similar to the synovium. It avoids the technical difficulties of sampling the true synovium in a knee joint. Directly administering an inflammatory stimulus to a knee joint and subsequently collecting inflammatory exudates is technically very challenging to perform without causing damage leading to inflammation. 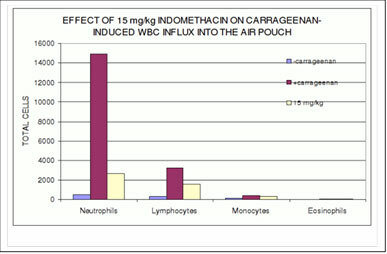 A reduction in carrageenan-induced inflammation is used to measure efficacy of a test compound administered prior to carrageenan treatment. In addition to an assessment of anti-inflammatory activity of a test compound, the Air Pouch Model may provide insight into the mechanism of action. The inflammatory response involves multiple interactions between signaling pathways which have developed a high degree of redundancy. Through differential cell analysis of inflammatory exudates, this unique model identifies possible cell types suppressed by the test compound and hence potential underlying mechanism of drug action.